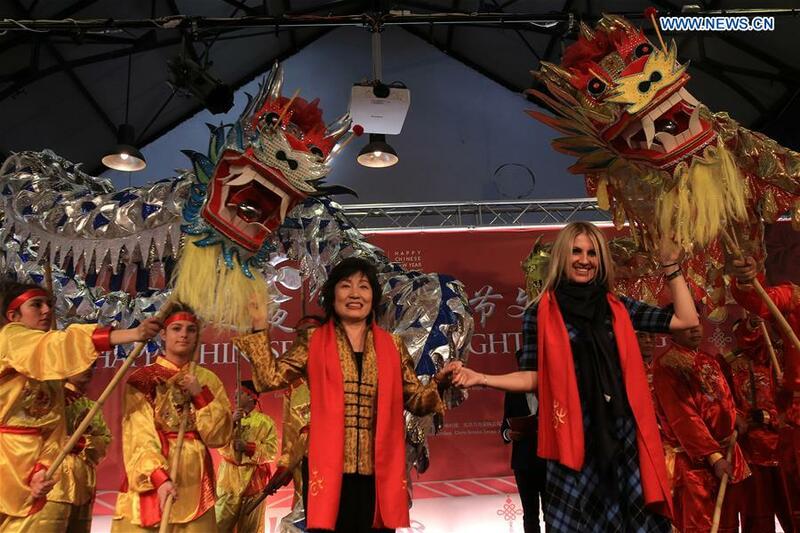 An enthusiastic crowd of Greeks of all ages joined on Tuesday Chinese living in Athens in a celebratory event to welcome the upcoming Chinese New Year, or Spring Festival, which falls on Feb. 5 this year. A giant costumed character of pig greeted the audience of the "Happy Chinese New Year 2019-Night of Beijing" show at the entrance, as the year 2019 is the "Year of the Pig" according to the Chinese Zodiac. The hall of the Technopolis cultural center, a major cultural venue in Athens, where the show was staged, was fully packed the night. The performance given by artists from several prestigious troupes in China, such as Beijing's Dance Academy and China's National Acrobatic Troupe, enthralled the audience. 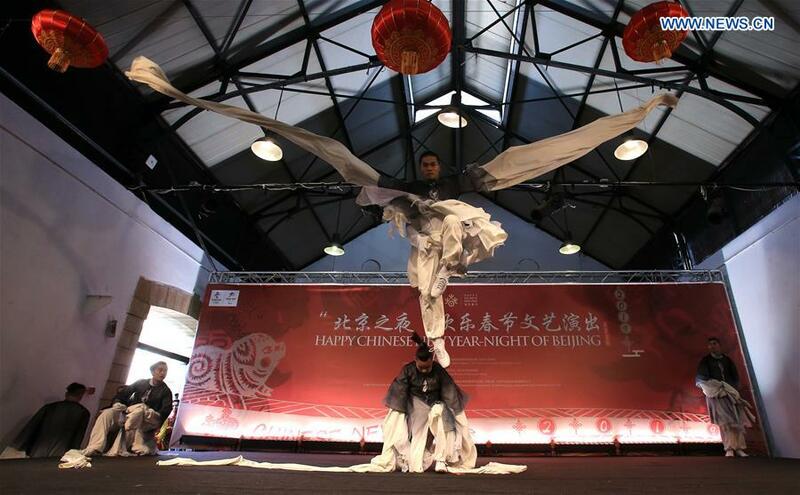 The show was opened up by dragons dance performed by both Chinese and Greek youth. The two dragons, one red and one blue, were believed to symbolize China and Greece, as they are the colors of the national flags of the two countries. The show was also attended by officials from both China and Greece. Chinese Ambassador to Greece Zhang Qiyue addressed the event. "Although China and Greece are far away geographically, they respect and understand each other and are linked with strong friendship," said the Chinese ambassador. She added that the cooperation between the two countries has proved fruitful, and the cultural exchanges between the two countries have increased a lot. The Chinese ambassador received a big applause when she wished "Kali Chronia", Happy New Year in Greek. Eva Kontostathakou, Vice Mayor of Finance of the City of Athens, on her part, expressed confidence that Sino-Greek friendship and cooperation will further flourish. "It was a marvelous show. We are very happy that we host this event in our city," she told Xinhua after the performance. "Let's have a happy new year, with health! Let's have a peaceful 2019, with hope and optimism for the future," she added, sending warm wishes to Chinese people. 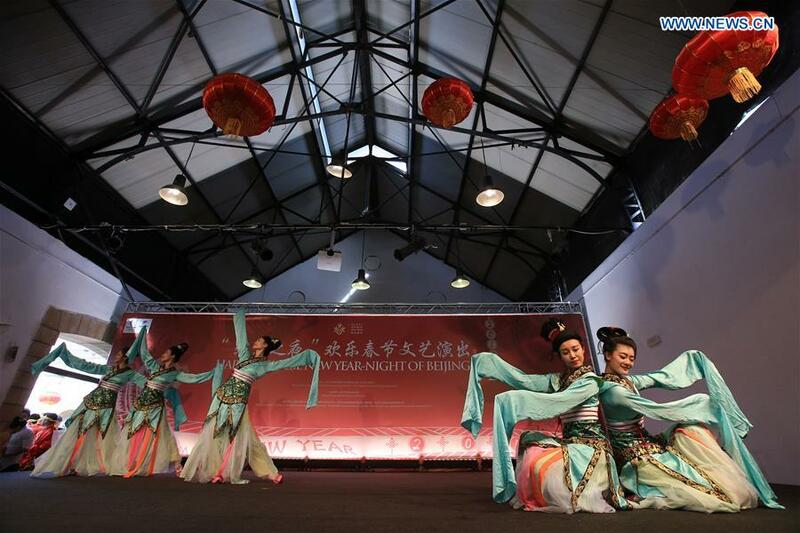 The two-day event which ends on Wednesday was jointly organized by the Chinese embassy in Greece and the Beijing municipality with the support of the Chinese Cultural Center in Athens and the Chinese community, businesses and media in Greece. At stands set up at Technopolis, visitors can also get a taste of Chinese delicacies, and get introduced to Chinese culture and traditions through books and handmade gifts. "I like the civilization and the culture which is so different from ours, very different. It is very interesting to see and learn more about history," Vassilis, a young Greek who studies the Chinese language, told Xinhua. It was his first time to joint a Spring Festival celebration. "It is so nice, very nice. I love it, the dances, the acrobatics, everything," he said. Panagiotis was also for the first time in the festival celebration. "I was curious to follow it, after seeing photographs about it from previous years," he told Xinhua, before sending his wishes to Chinese people. "(I wish) Health to all. I don't know what else to say. Let's have a good spring," he said. Ioanna, was among the Greek students who performed the dragon dance. "It was a great experience. It was our first time. We had two rehearsals, but I think the result was very good and the atmosphere was amazing," she said, expressing eagerness to participate in many more such events in the future.